A big change, as the headline says, but first the news: As reported here Friday, after five consecutive years of growth following DC's "New 52" reboot, the Direct Market gave back some of those gains in 2017 — and December served as a lackluster finish to a disappointing year. Overall, Direct Market orders finished the year at $522.25 million, off 10%. Click to see our sales estimates for December 2017. 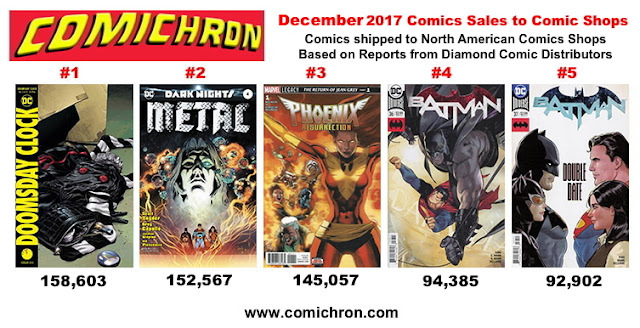 While publishers appear to have shifted into their winter crouch early, DC did slightly improve on its previous December, thanks in part to Doomsday Clock #2 and Dark Nights Metal #4. The former had shipments in the month of over 158,600 copies. But the overall direction was down. It was a straight-up comparative with December 2016, as both months had four shipping weeks. Saga Vol. 8 was the top-selling graphic novel, with the new release topping 21,100 copies ordered. I have also just posted, as well, Comichron's Top 1000 Comics and Top 1000 Graphic Novels for 2017, along with market shares; more detailed analysis posts will follow. But first, the big change, which is to be found in data already released. In short, there's more of it — a lot more. Beginning with the December report, Diamond has increased its reporting to include the Top 500 comics and Top 500 graphic novels. The move with regard to comics appears to have been a response to the fact that sales levels at 300th place have grown dramatically over the last decade and a half, pushing a significant number of releases of interest outside the Top 300. Comichron calculates that the extension from 300 to 500 comics brings the number of shipped comics units captured by the table in December from 91.9% to 97.4%. Post-300th-place data had been available sporadically for comics and graphic novels over the years. Diamond had previously switched temporarily to running the top 400 in 2013-14, but that appears to have been more of an oversight, where this is known to be an intentional policy change. 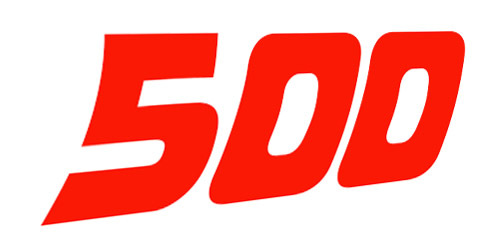 Because Diamond releases Top 50 charts for independent and small publisher comics and graphic novels, as well as manga, some items after 300th place have been known and published on Comichron over the past five years — but it was always scattershot. Now, we'll have more information every month, so we've used the past data to create a new page tracking 400th place items across time. All items on in the independent and small publisher charts were captured by the Top 500 list in December. There will be material, eventually, for a 500th-place table, though the reader will see that quite a lot of reordered items appear in the lower ranks; if a figure looks low for a comic book, it's worth looking at the month before to see if there's an earlier, more highly ranked entry. The increase in the number of graphic novels could possibly have been done to keep the chart consistent with the comics one; whatever the reason, the move performed a service in that the table now captures a little more than half of the graphic novel units shipped. For years, I've explained that the "overall" sales figure includes millions of dollars worth of material uncaptured by the Top 300 charts; in December, for example, the Top 300s only capture $28.67 million of the projected $38.49 million in sales overall. The additional 200 comics and graphic novels bring the total up to $31.31 million. So what's in the missing seven and a half million dollars? Answer: the other half of the graphic novel revenue, all of the magazine revenue, and the missing fraction of comics. Thousands and thousands of different backlist books. On Friday, Diamond announced that it shipped 7.4 million graphic novels to the Direct Market in 2017; December's share of that you might figure at somewhere over 600,000 copies. How many units were sold of the Top 500 graphic novel sales for the month? Right at 350,000 copies. With those valued at $7.71 million at full retail, the other 250,000-plus would easily soak up the lion's share of the unreported dollars, with unreported comics and all the magazines covering the rest. As will be seen in the table below, Comichron's measures, while reporting the Top 500 comics and graphic novels, will continue to use 300 items as the main benchmark, since it allows for comparisons across the largest span of Direct Market history.